We, Assure Enterprises from 2017 are one of the famous Manufacturers, Traders and Exporters an extensive array of Cortex Screw and Bipolar Prosthesis. Our offered range consists of best grade Cortex Screw, Bipolar Prosthesis, and DHS Barrel Plate. All offered products are designed under the direction of our domain experts using quality tested material and latest technology at well-equipped infrastructure unit. This product range is highly required for their features like easy to use, simple design, durability, strong construction, and lightweight. Our proficiency allows us to offer these products to various sizes. Our mentor, Ms. Sarita Nalwa, has guided us to be able to famous in this domain. Her vast industry experience has helped us to position ourselves in an unparalleled position in the industry. We have constituted our working team with highly qualified and experienced persons. Also, we hire a person strictly on the basis of his qualification, knowledge, and experience. Furthermore, we regularly arrange training sessions for increasing knowledge and techniques to our employees. We are aided by a sophisticated and fully-integrated infrastructure facility. This enables us to manufacture high-quality products in bulk quantity. 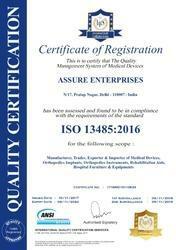 Moreover, this also facilitates quality testing of our array of cortex screw and bipolar prosthesis, to make sure that these meet the industry quality standards. To ensure that all the processes run fluently and smoothly, we have divided our spacious infrastructure into departments such as manufacturing, logistics, quality control and R & D.
Our mission is to provide premium quality cortex screw and bipolar prosthesis to our clients. Our precision-engineered products are checked before final delivery for their durability and finishing standards. We have facilities for testing physical properties of the raw materials used in the manufacturing process. In addition to this, our quality controller ensures that our products have quality standard & which is the report given by customers & end users. 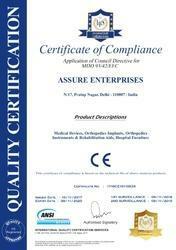 We follow stringent quality policies for assuring consistency in the offered cortex screw and bipolar prosthesis. Our products are designed with premium grade of raw material. Apart from this, these products are also tested over several parameters to avoid any discrepancy at the customer end. Exporting Countries: Myanmar, Dubai, Egypt and much more.